"Why don't you go? 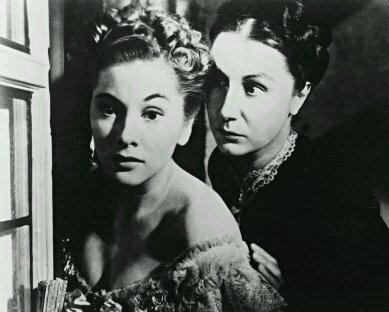 Why don't you leave Manderley? He doesn't need you. He's got his memories. He doesn't love you -- he wants to be alone again with her. You've nothing to stay for. You've nothing to live for really, have you? Look down there. It's easy, isn't it? Why don't you? Why don't you? Go on. Go on. Don't be afraid." 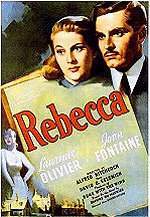 A poster from Hitchcock's REBECCA (1940) with Laurence Olivier. 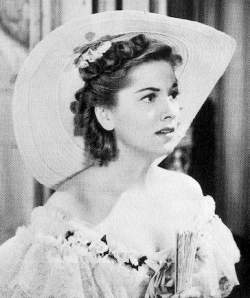 Fontaine received the first of her three career Best Actress Oscar nominations for her role as "the second Mrs. de Winter" in this, the Best Picture of 1940. "You're just about the stupidest man I ever met." --as Lady Alyce in A DAMSEL IN DISTRESS (1937). "By the time you read this, I may be dead..." --as Lisa Berndl in LETTER FROM AN UNKNOWN WOMAN (1948). "Tell me, when you climb up the mountain, what then?" --as Lisa Berndl in LETTER FROM AN UNKNOWN WOMAN (1948). "I know nothing happens by chance. Every moment, every step is measured." 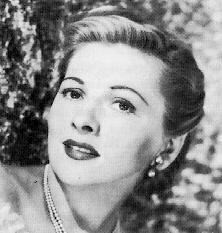 --as Lisa Berndl in LETTER FROM AN UNKNOWN WOMAN (1948). "Does it make any difference, having an aim in life?" --as Mavis Norman in ISLAND IN THE SUN (1957). "You know what they say about me? 'Poor Mavis Norman. Always getting into trouble. Always picking the wrong man.'" --as Mavis Norman in ISLAND IN THE SUN (1957).